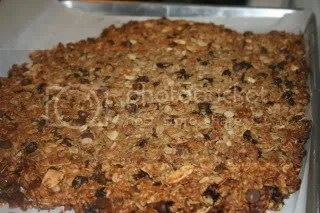 I need to be honest right from the start and let you know that I didn’t intend for this recipe creation to become this granola snack. I really intended this to become granola bars similar to what my kids eat from Trader Joe’s. I had all of my ingredients laid out and the best intentions. I even promised my older daughter that she would get the first taste. Alas, the bars didn’t hold together too well. I must not have had enough moisture in the granola mixture. So this became some mighty fine snackin’ granola. Similar to what you can find in those big tubs at Costco. My friend graciously refers to this mixture as “Costco Crack.” It really is addicting as a snack. Would also be great as a yogurt topping. In a huge mixing bowl, mix up all of your dry ingredients. In a small sauce pan, warm up the honey and the peanut butter. Stir together until it is all melty. 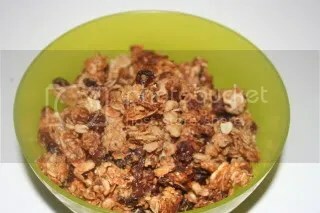 When melted, pour the mixture over the granola mixture. Mix it well. Press in to a rimmed cookie sheet. Check at 15 to make sure that it isn’t burning. Break up in to clusters.